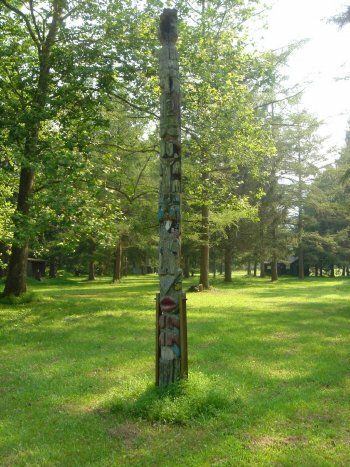 Sometime this past July the two totem poles that had stood at opposite ends of the parade ground of the old Boy Scout Camp Kline just south of Ramsey off the Pine Creek Rail Trail "vanished in the night." According to DCNR, the Boy Scouts of America, the organization that still owns the ground, did not contact them about any removal. Apparently stolen, these sentinels, which stood witness through the years to the happy adventures of many young boys and were then enjoyed by visitors for approximately 35 years after the camp closed, may now stand in someone's private yard, their connection to a sacred place broken by some noncaring, selfish person or persons. This writer was fortunate enough to have taken photographs of them, and they are here displayed with the slim hope that someone may recognize one or both of them standing in the guilty party's yard. If that happens, it would be a very good act to report the finding to DCNR's District Office in Waterville. History is very important in people's lives. When someone thoughtlessly deprives others of records of the past, the robbery diminishes their understanding and appreciation of that past. And the perpetrator condemns himself to a life of guilt.